Today I'll wrap up my unintended series of posts featuring Lizzy House foxes! 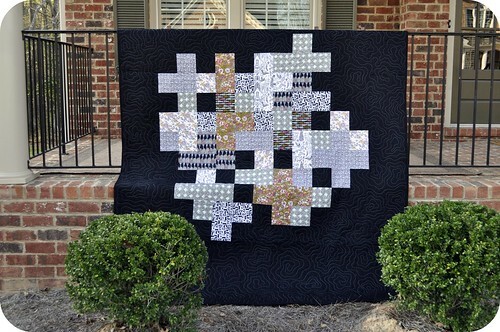 i just planned on making a baby quilt from that pattern - but haven't secured the pattern yet! the idea is to use red, pink, blue and green! Congratulations, Melissa! 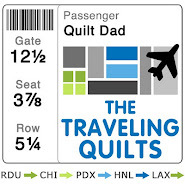 I can't wait to see your baby version of the quilt. I also wanted to share a small piece of embroidery that I recently completed. 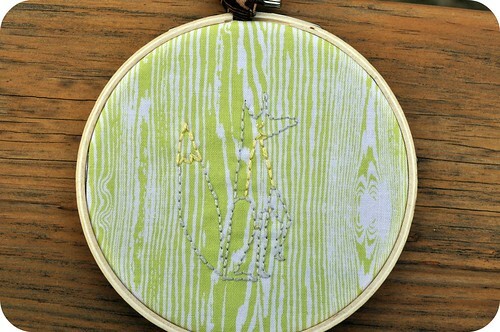 I participated in the Wild Olive Stitch Swap, hosted by the very talented Mollie Johanson of Wild Olive. I've been a big fan of Mollie's for a long time now -- pretty much since I first started embroidering and came across her blog (and her adorable patterns which can be found in her Etsy shop). 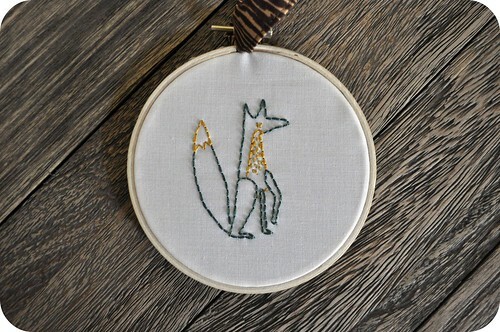 Mollie recently organized a small embroidery swap -- small not because of how many people participated, but because we only had to stitch up a small piece for our partner! 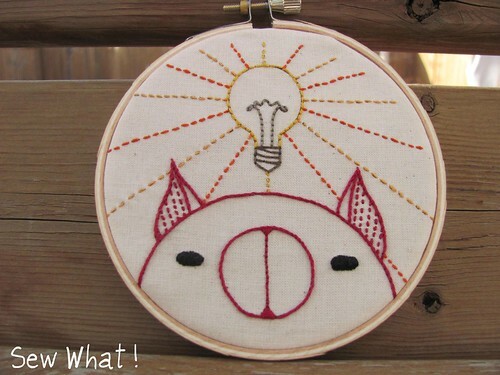 The idea was quite genius, actually -- we were limited to a 4" embroidery hoop, which helped this to be a very low-stress and manageable swap to complete. I was paired with Julia from the U.K., who indicated that she loves woodland creatures, and her favorite colors include green and gold. 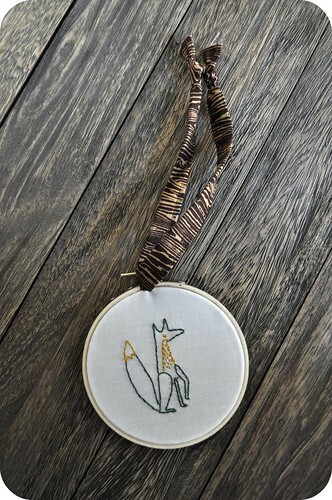 I knew immediately that I wanted to stitch up one of Lizzy's foxes. Err, I know foxes are sly and all, but you can barely see the little guy. So I started over, this time trying out a gold floss with some dark green accents. Yuck. I just wasn't feeling that color combination either. I decided to try one more time -- and this one had to work, because I don't do nothin' four times over. Ah, just right. I ditched the woodgrain print -- which was a great idea in theory, but I just couldn't make it work -- and went with bolder colors on a solid white background. Much, much better. Want to see the fantastic piece of embroidery I received from my secret partner? 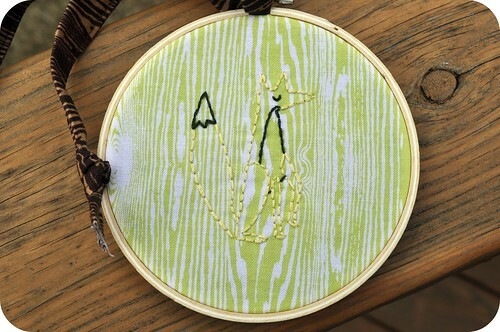 This amazing little piece was stitched for me by Jen (aka eklundjen on Flickr). I absolutely love the work of artist (and embroidery pattern designer) Cate Anevski, and Jen stitched up one of my favorite patterns for me. Thanks, Jen! This one is going up in my cube at the office. Anybody stitched up anything fun lately? I didn't win the contest, but Brenda must have liked my bundle because she has made it available in her shop! 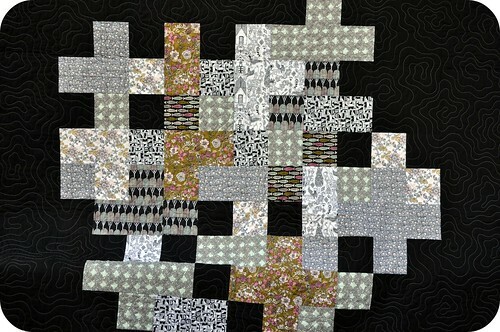 She supplemented my choices with a few solids and other staples and -- voila! -- there appeared a fabulous booster pack for Lizzy's fox print. I can't wait to get my hands on one of these bundles. 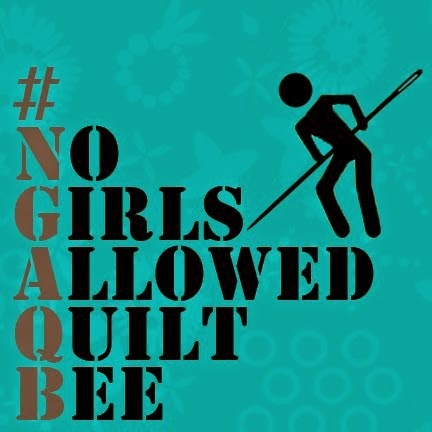 What kind of quilt should I make from it? Pattern suggestions welcome! And if you want to join me and pick up one of these bundles, you can find it here. PLEASE NOTE: the fox print itself is not part of the bundle. Be sure to get a 1/2 yard or yard of it to play the lead in your project, allowing these other prints to be the supporting players. Thanks for the fun contest, Katy & Brenda! Hello and happy Monday morning! For those who celebrated, I hope you had a wonderful Easter Sunday and holiday weekend. We had gorgeous weather here in North Carolina, and I also had a couple of very productive sewing days. I'll have to share what I worked on this weekend on another day (no pictures yet! 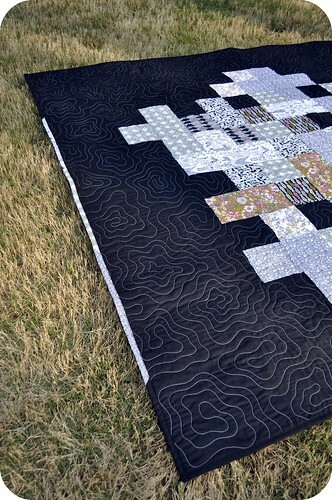 ), but in the meantime I have a WONDERFUL quilt finish to share with you. 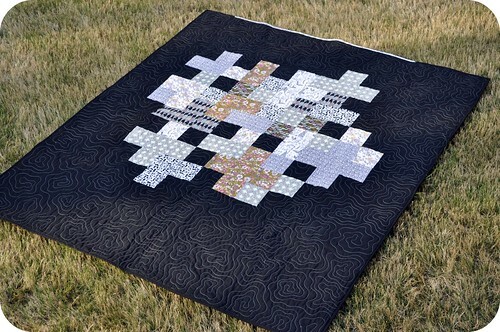 I recently completed this quilt, and it has immediately become one of my favorites. I've loved the Outfox the Fox quilt pattern by Lizzy House since she released it last year, and a few months back I had the idea to make one using the awesome Miscellany fabric line by Julia Rothman for Cloud 9 Fabrics. I decided to use black fabric -- and a lot of it -- as my background fabric. This was completely new for me, since I usually default to white, off-white, or light grey when using a dominant background color. Black was the perfect choice to highlight the Miscellany prints. And, speaking of those prints, they're really too beautiful to chop up, which is why Outfox the Fox was the perfect pattern to show off those large-scale designs. 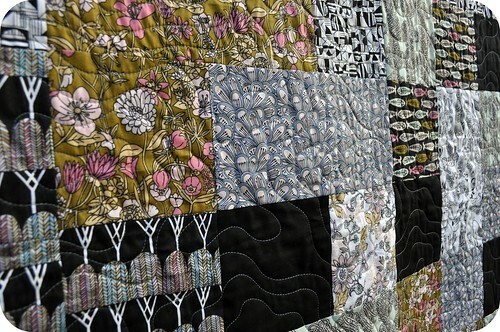 Just for fun, I added a few of the Miscellany scraps to my binding strip, and positioned them so that they'd run along the top edge of the quilt. It's an added bonus for the person laying under the quilt to catch a glimpse of the prints as he (or she, if I let someone else use it : ) pulls it up underneath his chin! 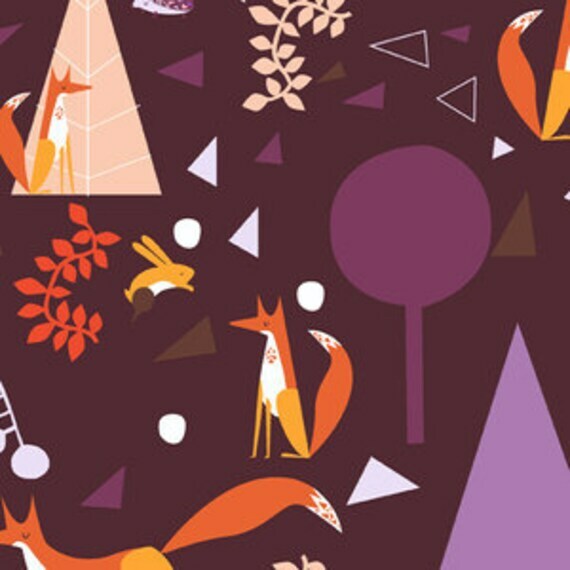 So, are you as big a fun of the big, bold, and modern Outfox the Fox pattern as I am? Well, today's your lucky day! 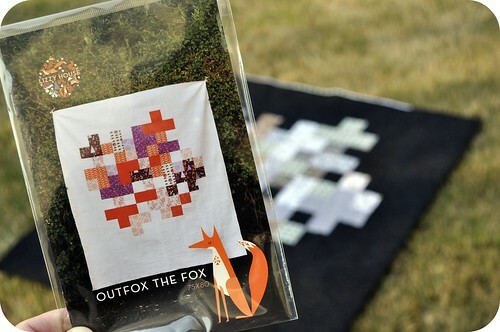 Lizzy herself sent me an extra copy of the pattern to give away to a Quilt Dad reader, and I'll even throw in a charm pack of Lizzy's Outfoxed fabric line that I have on hand. 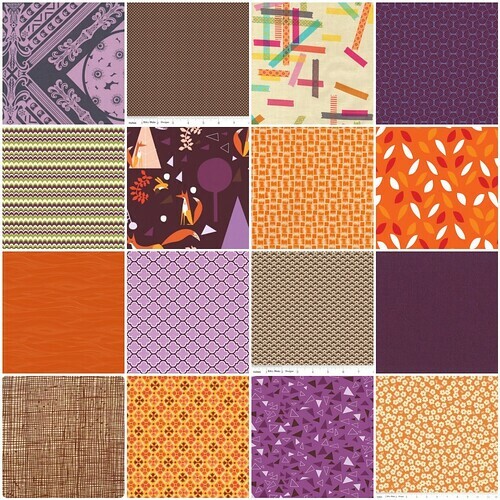 Simply leave a comment on this post and let me know what fabric you'd love to make Outfox the Fox with, including your choice of background color. 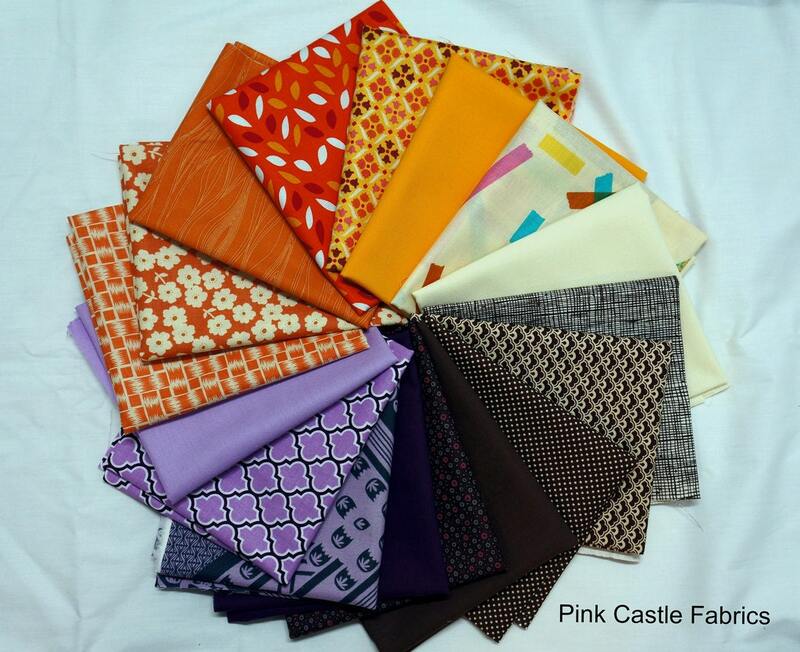 I'm curious to hear all of your fabric and color ideas!